Luniverre Gallery, located in Cordes-sur-Ciel, France exhibits glass sculpture by internationally established artists and emerging young creators who work in this rare and challenging medium. Glass takes on a totally different meaning in the exceptional environment that Luniverre provides; no longer brittle or fragile, it exudes strength and generosity. All manner of avant-garde glass works are on show, as each exhibit presents artists from all over the world working in contrasting techniques or with materials such as iron, ceramic, and paper. Founded by the British sculptor Marianne Spottswood in 1998, originally in Paris in the Marais, Luniverre Gallery has become a favourite haunt of glass collectors and connoisseurs alike. 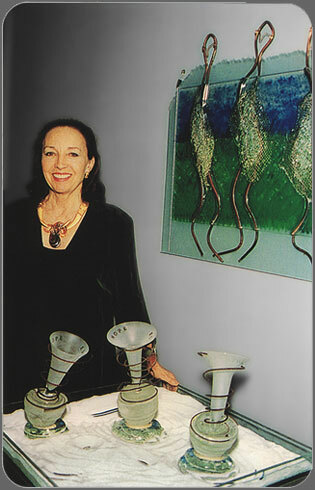 Besides original sculpture, the gallery also exhibits candelabras, screens, tables, and unique one-of-a-kind jewellery all made from glass. At the Cordes location, a second gallery has been opened, which will become part of a larger complex situated in a eigthteenth century mill house on the Cérou river. Currently being restored, the mill will eventually provide electricity from three turbines. Plans are for creating an International Summer School with small classes for advanced students.